I really, really do not enjoy camping. You could even say I dread and despise it. But once in a while a dear friend or a nice romantic interest "makes" me go camping with them. I try to go cheerfully, and of course slather on tons of sunscreen and stay out of the sun as much as possible. 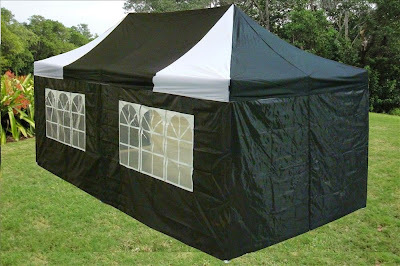 I have to say, if I could go camping in a stylish black tent like this one, my attitude might improve greatly. 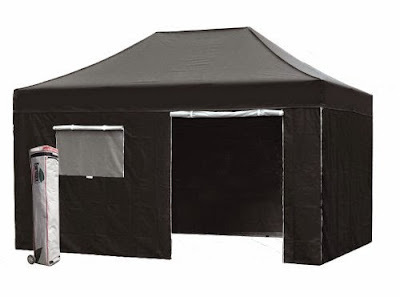 This is the 10x15 tent - they make other sizes. 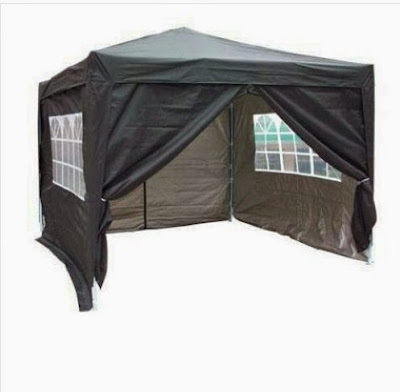 This is more of a party tent than a camping tent though. Here's a more traditional two person camping tent in "Black magic." 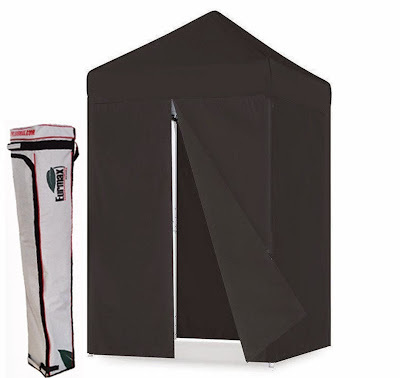 Their little 5x5 pop-up tent might be the perfect thing for my outdoor office. I do like to work in the backyard in summer as much as possible so my dogs can be out with me enjoying the yard all day. (One of my demon dogs is prone to sneaking away under the fence if unsupervised, grr!) I could fit a little chair, a little table to hold my iced tea or let's face it, sangria pitcher, and work with my laptop on my lap. 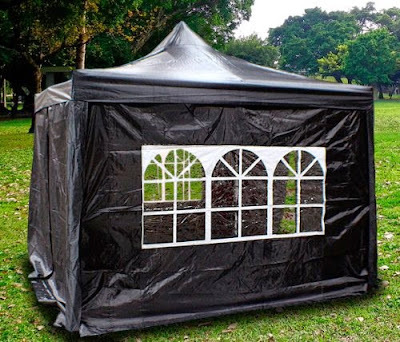 This tent is black and red, in case you're camping with pirate goths. In fact, I've been on a pirate camping trip before (with non-goths) and it was really surprisingly fun. Ok, these are party tents, not really camping tents. 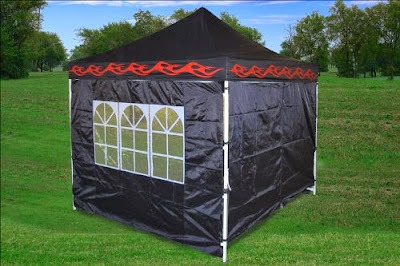 But anyway.. Are you giggling at this Black Flames tent like I am? Is it a bit too rocker or metalhead? 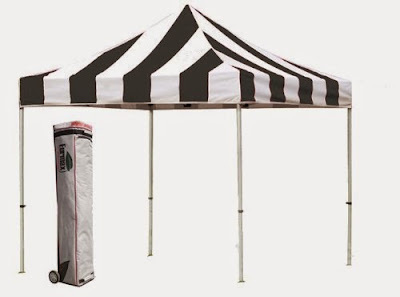 Here's another huge black and white 10x20 party tent. I own a QuicTent (in turquoise) and love how easy it is to set up. But I wonder if the white windows rather ruin the gothic aesthetics on this one? 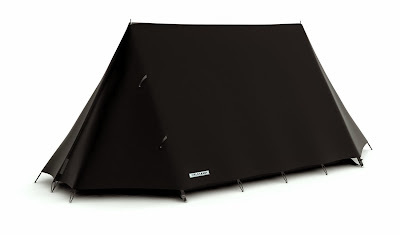 Here's a similar tent from MTN Gearsmith. 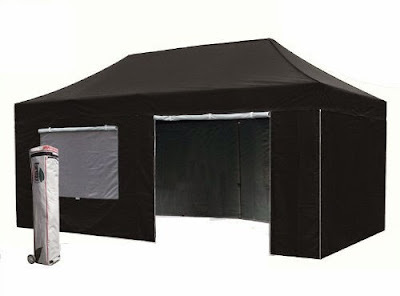 What if you don't need a whole tent, just a canopy to provide shade? 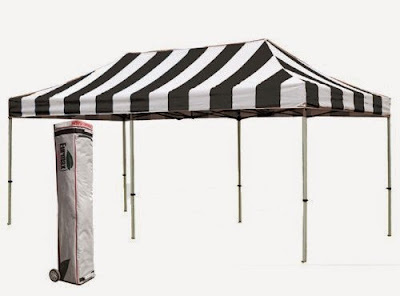 Here's a Burtonesque striped black and white 10x10 canopy. 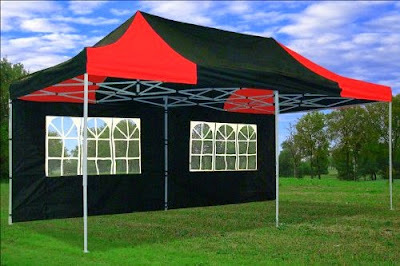 Or here's a larger striped canopy, 10x20 for big goth festivals. 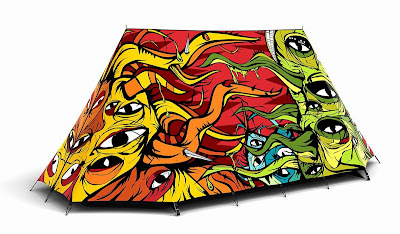 This horror-themed Field Monsters Tent by FieldCandy cracks me up.